Update #14: "We really shook the pillars of heaven, didn't we Wang?" Backers, we'll hold our Second City Survey soon and contact you for your Swag info! For now, we're heading over to Shadowrun.com and our new forums! Update #11: Since we’re sharing. . . If you can't use Kickstarter, you can use PayPal! Shoot Straight. Conserve Ammo. And Never Cut a Deal With A Dragon. According to the Mayan Calendar (and lots of tabloids), the world will end on December 21, 2012. It’s part a 5,200 year cycle of death and rebirth that, in Shadowrun, actually charts the ebb and flow of magic from the Earth. So, on 12/21/12 magic will return, end this world, and wreak holy havoc while starting the next. Aboriginal cultures, who maintained their mystical traditions, are the first to feel the return of magic and use their newfound power to reshape the political, financial, and physical world around them. As the magic increases, Elf and Dwarf babies are born to very surprised parents who carry the right combination of long-dormant genes. But all of these events pale in comparison to the horror of "goblinization", which painfully reshapes the teenage bodies of those unlucky enough to carry dominant Ork or Troll genes. And then the first Great Dragon rises from its 5,200 yearlong hibernation and circles over Tokyo, signaling that the world has truly AWAKENED. There are a couple of key ideas at the core of Shadowrun Returns. The result should be an overall narrative that is layered, textured, and satisfying. One of the many innovations in Data East’s Shadowrun Super Nintendo game was a unique conversation engine that opened up new avenues of conversation based upon information you learned through interactions with characters and objects. We intend on taking a similar path with a new twist or two. Four realities overlap in the world of Shadowrun (the Physical, the Digital, the Mystic, and the Astral) and associated character classes such as the Street Samurai, Hacker, Combat Mage, and Shaman, each have the ability to view and interact with the world in ways the others can’t. Missions (aka "Runs") in Shadowrun Returns can require interaction with all four realities simultaneously, requiring you to use information learned from each character’s perspective to coordinate their context-sensitive actions to get the job done. . . and survive. That’s why we decided to make Shadowrun Returns a turn-based game—so we can offer you a wide range of context-based gameplay options from which to craft a your plan. One of the things that we feel most strongly about is that the world of Shadowrun was created for all of us to tell stories within. That’s one of the beautiful things about in-person tabletop role-playing—the stories are extremely relevant to you and your friends because they were made by you and your friends. In honor of that tradition, we plan to release our PC-based level editor when we release Shadowrun Returns so that everyone can create their own Shadowrun stories & “runs”. When you upload your stories, you can make them available to your Friends Only or the entire Shadowrun community. The game we want to make is very humble by modern blockbuster game standards but it is still way beyond the ability of a small start-up to fund by itself. The restraints on the license from Microsoft made it impossible to get established publishers interested in Shadowrun and so it remained just a dream for a long time until Jordan saw the recent successes of some other veteran designers on Kickstarter. Crowd sourcing to fund creative content represents truly profound change to the status quo. While we watch financial models for the creation and distribution of creative content continue to erode, Kickstarter charts a direction for how fans can directly impact development of creative content they want by funding its creation. We hope that Shadowrun Returns is a creative concept you want to help make into a reality and we thank your consideration and support. And so, our favorite game has come full circle and Jordan is again leading the development of a world he started oh, so many years ago. And for those of you that have been around since the very early days, we want to make sure that YOU understand that WE understand and that we'd love to see things like this (and more) in the game. Ares Predators and Ruger Super Warhawks (yes, with smartlinks), Maglocks and Doc Wagons, datajacks and credsticks, dermal plating and wired reflexes, “chummer” and "drek", Ares and Fuchi and Aztechnology (Oh my!). A Digital Downloadable copy of the game, DRM free on PC, Mac, or Linux + one totally sweet, exclusive desktop WALLPAPER for your PC, Mac, or mobile tablet. 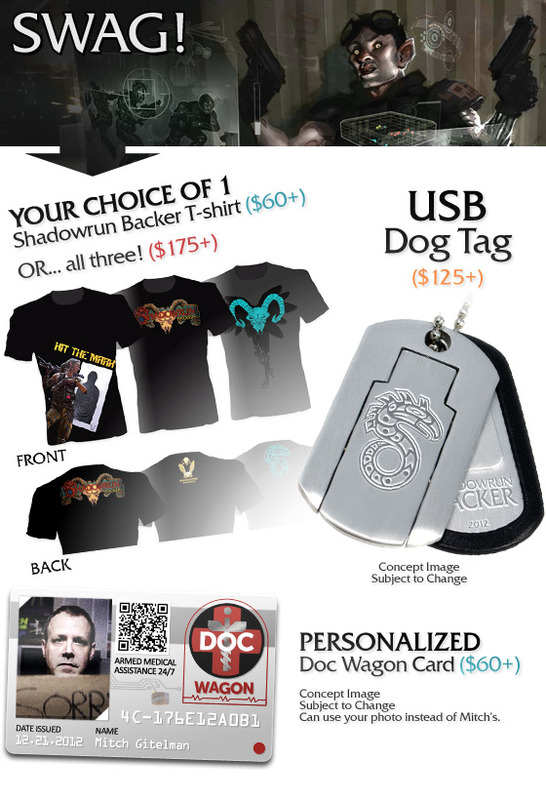 Previous reward + your character will start the game with a SPECIAL ABILITY only available to backers + a PDF version of the Shadowrun Returns Anthology, an ILLUSTRATED BOOK OF SHORT STORIES written for the game and edited by Jordan Weisman, the creator of Shadowrun. + NEW You will also get the IN-GAME DocWagon benefit of a fully-armed emergency ambulance or chopper to save your team of runners when the drek hits the fan. Note: This is an in-game service only. No armed medical extraction team will actually arrive at your home. More details in the FAQ. Previous rewards + we'll use YOUR IMAGE to CREATE AN NPC CHARACTER for the game. It's our choice what NPC you'll be but if you have a suggestion, we'll listen. Previous rewards + 1 Large or 2 Small custom art assets created for you to be used EXCLUSIVELY in your missions (Limit 2 revisions) + a CONSULTATION with our Art director and Level Designer to help tune one of your shadowruns. Previous rewards + spend the AFTERNOON AND EVENING at Harebrained Schemes World Headquarters. You’ll have LUNCH WITH JORDAN AND THE DEVELOPMENT TEAM and then PLAY SHADOWRUN WITH JORDAN. Your Game Master will be Mike Mulvihill, who led Shadowrun game development at FASA Corp. (You must be able to travel to Redmond, WA).